View our inexpensive engagement rings here. Engagement rings have signified love and devotion for centuries in many cultures around the world. Before stones were incorporated, plain bands were common. Rings were chosen as the perfect symbol of unity and love because they have no beginning and no end. This made them a wonderful choice to symbolize eternal love and devotion. Engagement rings are thought to have developed from a circle, sphere or disc that was simply held to a ring that could be worn. Since then, the engagement ring has evolved into a piece of jewelry that can have any number of precious gems set into it. Choosing the right engagement ring for your partner can be a difficult process these days due to the large selection that is on the market. While the vast majority of people choose diamond engagement rings for their bride to be, there is no reason that you cannot choose something with a little more color. Although most women prefer a brilliant diamond, some women simply do not like diamonds. Just keep in mind that this is a ring that she will continue to wear even after you are married; therefore, the stone is going to have to be a fairly hard one if you want to ensure that you will not have to replace it every couple of years. The engagement ring style should be somewhat timeless and not too trendy. You want your lovely wife to wear your special ring with pride for her entire life. Novori has solitaire rings, three stone rings, rings with sidestones and unique tension set rings. There are many different places where you can purchase the perfect engagement ring. You can buy already designed ones or, if you have an idea of what you want the engagement ring to look like, feel free to contact us about getting a custom made engagement ring. This will most likely cost you more money but this is definitely worth the extra cost. If you want to get an antique engagement ring, try a search online for antique jewelry. Antique jewelry can be hard to find but you can easily find some online. In fact, online shopping is probably your best bet when it comes to shopping for a ring. 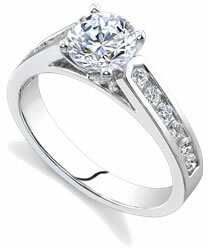 Even if it is only to get an idea of the selection that is out there and the prices that engagement rings carry. Not all stores are created equal and you should only deal with the finest when you are looking for the perfect engagement ring for your loved one. Novori custom makes each ring and does not import rings from overseas. The ring selection that you will find on the Internet is much greater than you will find in any store and you will save yourself a lot of time. At Novori, we pride ourselves in our enormous selection of beautiful engagement rings.